The Aquarius and Taurus in love in a romantic relationship will have to figure out how to work as a team. They can easily accomplish a lot together. The Taurus zodiac has a rational and grounded look at life. They do not like change. Aquarius will have an unconventional and extraordinary way of looking at almost everything. However, they will be the most progressive of all the zodiac signs. They might seem like they do not have a lot in common. However, they will both have a very strong desire for success. The Aquarius Taurus relationship might work better together in a business relationship than in a romantic one. Aquarius is an Air sign. They concentrate on intellectual bonds and pursuits. Taurus is an Earth sign. They concentrate on more rational and seductive interests. They will want to know how something can benefit them in accomplishing their goals. At the same time, Aquarius personality will want to know what else there is. They might both find it hard to understand each other. They could argue if the bull is too possessive. If Aquarius is too emotionally distant then they might have disagreements. They will need to have a relationship that is based on a lot of love and respect for each other. The Aquarius Taurus soul mates will both be able to grow to understand how each other works. Aquarius and Taurus are both Fixed signs. They will both be stubborn. Once they make up their minds, they do not like to change their view or opinion. They will be steady in their personal life. When they decide they are committed to the relationship, they are not likely to end it. This will be good if the Aquarius Taurus friendship is smooth and benefits both of them. At the same time, if the Aquarius Taurus compatibility is inhibitive for them and they are not able to admit it, then they could hurt their progress in life. They will both need to recognize that they will be more productive when they work together than when they work against each other. The Taurus personality will be more rational. Because of this, they might be the first to back down in a fight. However they will only do this if it seems rational to do. The best thing about Aquarius Taurus love compatibility in a romantic relationship is the power they have when they work as a team. However, they will have to be sure to clear any obstacles from their path. They will both have personalities that are very powerful. They will not be able to control each other but they will try. They can have a relationship that is contented and exciting. However they will have to work out how the the Aquarius Taurus marriage will turn out to be. Aquarius and Taurus compatibility can work well together. However, they will both need to be very in love with each other. They will both need to think about each other’s ruling planets to be able to understand each other. Venus rules over Taurus. This is the planet of beauty, love, romance, and the good life. Saturn and Uranus rule over Aquarius sun sign. Saturn is the planet of restriction, responsibility, severity, and austerity. Uranus is the rebel planet, the planet of the unexpected. Aquarius dating Taurus will have less compatible when Saturn will not let Venus live the lifestyle they want. They will be less compatible when Uranus challenges Taurean’s love of stability and comfort. However, they are going to be able to offer each other something. Aquarius is not going to want to admit it, but they find the bull’s steady base comforting and encouraging. Taurus will find the water bearer stimulating and comfortable. The planets Saturn and Uranus rule over Aquarius birthdays. The planet Venus rules over Taurus. Saturn is concerned with delays. Uranus is about everything being strange and weird. Venus is about beauty, romance, and seductive pleasures. Taurus finds the Aquarian’s traits important and pleasing. Saturn will make the water bearer focus on hard work and discipline to accomplish their goals. Uranus will give Aquarius their revolutionary way of thinking. They will learn that beauty and comfort improve life. Taurus can teach the Aquarius man or Aquarius woman that life is based on emotions. Aquarius can teach the Taurus man or Taurus woman to keep working to improve. Both the star signs can learn an important lesson in how to move away from something that is not working. Aquarius Taurus love compatibility can make the relationship work, just by their own strength of will. Because of this, they can learn a lot from each other. Aquarius can show Taurus that there is a big world out there they are not even looking at. They will be able to help soften some of the bull’s selfish nature. Taurus can give Aquarius an emotional and rational base. Aquarius men and Aquarius women have a strange nature and could definitely use that kind of base. They will both work hard to make this Aquarius and Taurus compatibility work out. Aquarius and Taurus star signs are not opposite in the zodiac. However, they have personalities that are very opposite. Because of this, the Aquarius Taurus relationship might be uncomfortable. They do not have a very high romantic compatibility because they have such different views on life. Aquarius is the visionary of the zodiac. They will be eccentric. Because of this, they will not be able to understand the desire of the bull. Taurus is the lover of the zodiac. They want a conventional, stable life. The lover does not like the visionary’s emotional distance. Aquarius and Taurus soul mates can both be very opinionated. Because of this, they will have to be careful to not have a lot of disagreements. They both have very different reactions to tension. When Taurus is angry, they will want to charge. When Aquarius feels stress, they will pull away and be emotionally distant. They will want to put space between them and the source of their stress. Taurus will push harder and Aquarius will want to pull away more. This will start a vicious cycle. They will like to do things their own way with no arguments. The Aquarius is modern and progressive. They might think the Taurus female being dedicated to their routine is boring. Taurus men will think Aquarius women are exciting. However they might feel frustrated about trying to keep up with the water bearer being inventive and having a quick mind. Aquarius and Taurus in bed too might have differences that might leave them both sexually displeased. In the Aquarius and Taurus marriage, they will have trouble finding a way to communicate. They can be very much in love. However, they will still be speaking different languages to each other. They will have disagreements. Taurus will keep pushing the point further than their lover would think it was possible to. Aquarius will be able to infuriate the bull because they will back away more and will not want to discuss anything. They will have different idealism. Aquarius will want to save the world. Taurus is only going to be interested in protecting their loved ones. However, their basic natures will cause arguments for them. Taurus born is very clingy and will be very envious. At the same time, Aquarius will want independence more than any other zodiac sign. The bull might try to get more commitment from the Aquarian. However, the water bearer will run leading to an Aquarius Taurus breakup. Aquarius and Taurus can be compatible if they both want it. However, it might not ever be as comfortable as relationships with other zodiac signs. Taurus compatibility means they will need to be able to trust their partner. However, Taurus might feel that they are not able to trust the water bearers. Aquarius can be weird, eccentric, and unpredictable. Aquarius Taurus compatibility has elements that do not naturally work well together. Aquarius is an air sign. They do not need earth very much. Taurus is an earth sign. They will be shaped by the air. However, air can also make a dust storm that the earth will get caught in. Because of this, they might both be unhappy. 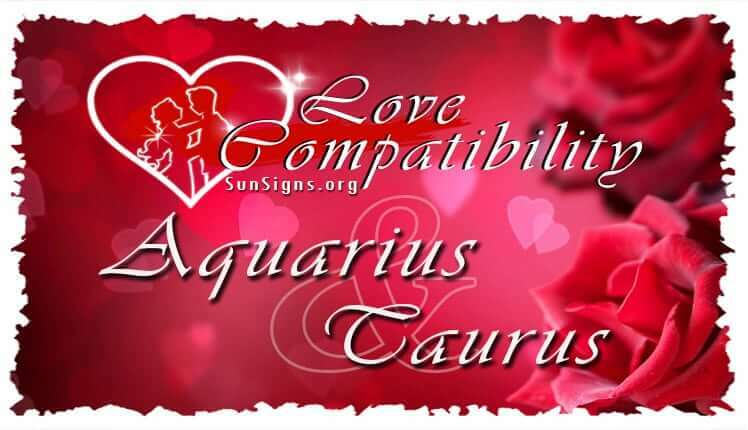 Aquarius and Taurus love compatibility will work better together as friends or in a business relationship.